The first Israeli film shot in Jordan, Amos Gitai’s uneven character drama seems to draw inspiration from American road movies in his tale of three unlikely women who journey together by car in the duty-free zone between Israel and Jordan. Natalie Portman stars as a young American woman named Rebecca who is still nursing the emotional wounds of a bad breakup when she asks her Israeli driver Hanna Ben Moshe (Hana Laszlo) to let her tag along for the ride as Hanna makes her way across the roadblocks into Jordan where she hopes to get back the money owed to her husband from the car trade business after they’ve suffered a tragedy. 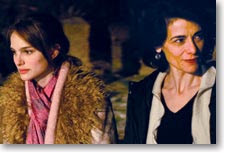 Once in Jordan, they meet the third woman, Leila (Hiam Abbass), who like the other two is struggling to deal with the after effects of crisis and living in a predominately man’s world, being forced to try and handle business affairs among themselves as she and Hanna argue over missing money that Leila and her American contacts owes to Hanna. An exercise in the futility of the situation in the Middle East in regards to characters who can’t speak each other’s language and struggle to trust one another—Rebecca serves as a metaphor for America and she gets caught up in the middle of the conflict that is refreshingly illustrated for audiences as we see all sides and realize that each have valid arguments and anger. In English, Hebrew and Arabic, the film volleys uneasily between the languages and a complete subtitled track would have been beneficial throughout the entire running time as sometimes with the poor audio quality and thickness of the accents, it’s fairly hard to make out what the characters are saying which is frustrating, especially when realizing that they are revealing important character identity traits and plot developments. A bit tedious and distanced from the viewer in places, it’s still an interesting film and earned Laszlo the Best Actress award at the 2005 Cannes Film Festival.